The Berkeley College Department of Athletics recently announced the appointment of Jeffrey Menaker as Head Coach of the Men’s and Women’s Tennis program. The Berkeley College Men’s Tennis team’s season starts March 25, 2017. The Berkeley College Women’s Tennis team will begin their season in September 2017. “I look forward to working with the talented student-athletes on our tennis teams and building a tradition of success on and off the courts at Berkeley College,” Coach Menaker said. The Berkeley College Men’s Tennis team captured the 2015 Hudson Valley Intercollegiate Athletic Conference (HVIAC) title in its inaugural season. That same year, the Berkeley College Women’s Tennis team won the HVIAC title in its second year of competing. 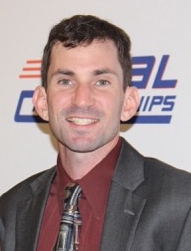 “Jeff Menaker brings a great deal of tennis experience with him to Berkeley College as he embraces the challenge of leading the institution’s tennis program into the future,” said Andy DeStephano, Berkeley College Director of Athletics. A resident of Queens, NY, Coach Menaker comes to Berkeley College after serving as the Director of Tennis/Head Men’s and Women’s Tennis Coach at Hofstra University in Hempstead, NY, for the past year. Before that he was the coach of the Men’s and Women’s Tennis teams at Lehman College, leading both teams to appearances at the City University of New York Athletic Conference Quarterfinals in 2015. He also served as coach of the Men’s Tennis team at Yeshiva University from 2010 through 2013. Coach Menaker’s experience in coaching scholastic tennis includes leading teams at Bronx High School of Science, Edgemont High School in Westchester County, and Stuyvesant High School in Manhattan to championship success. He has been a member of the New York State Public High School Athletic Association (NYSPHSAA) State Tournament seeding committee, and in 2014 helped coach the Public Schools Athletic League Boys’ State Tournament Team to its first ever NYSPSSAA points championship. In 2014, Coach Menaker was honored by the NYSPHSAA Section 1 Coaches Association with the Jim San Marco Award for Outstanding Leadership. He also served as the Junior Team Tennis Coordinator for the United States Tennis Association’s Metro Region in 2012. Coach Menaker graduated from Skidmore College in Saratoga Springs, NY, with degrees in English, Literature and Theater. While studying abroad at the University of Adelaide in Australia, he was the first American-born captain of the Lincoln College tennis team. He also attended the Shakespeare Program at the British American Drama Academy (BADA) in London, as well as BADA’s Shakespeare Course at Oxford University.